This is my first novel of Anita Nair’s. I love reading Indian authors, but never got a chance to read a gripping thriller from them. This is the first psycho thriller that I read from an Indian author and I loved it. Plot is about the investigation of similar serial crimes in Bangalore by an experienced inspector Gowda. Though Gowda is not young and dynamic, he is the hero of our story with his small imperfections. Story starts with a burnt body of young male prostitute in Ramzan month and series of murders of random men on every Friday with peculiar ligature strangulation on neck. Author introduces us to corporator Ravi’s life in parallel. What is the relation between murders and Corporator? How Gowda finds the pattern in the killings? Remaining story is about the clues and findings of Gowda. Gowda’s problems in his family life, affair with his ex-girlfriend etc., also form a part of the story. Climax is good and unexpected. Story seems to be intriguing till the end. It is a medium paced psycho thriller. It met my expectation for sure. Characterization and writing style are impressive. Climax is good, Reader will be sure of the murderer from the middle of the story, but suddenly realizes that it is not that person. Motive of the crime doesn't look very convincing. Sometimes, We feel , story is dragging and going no where, but, from the middle of the novel it picks the proper pace. Here is the discounted price from flipkart.com. 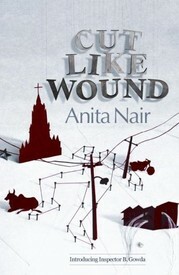 Cut like Wound is about a serial killer loose in Bangalore. As Borei Gowda tries to catch the killer, Anita Nair's narration brings alive Bangalore's sights and sounds. She captures the dilemma's of Borei's mid life crisis, his loneliness and his tendency to call a spade a spade. The novel moves leisurely yet is not slow. The book, unlike, other books in this genre does not present the hero as a caricature but as a mortal with his own share of doubts and desires and it is that depiction of Borei that lifts this book above the ordinary. A good read and I can't wait for more in the Borei Gowda series.